The historical Clawfoot Bathtub has a strong comeback in today’s Bathroom Design. 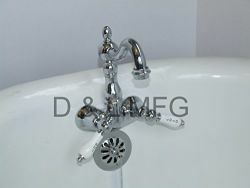 Therefore we are happy to supply you with Clawfoot Bathtub Products, parts and accessories. Nothing can more relax than a nice long soak in a hot bath. And with the added luxury of a clawfoot bathtub, you can even add style to it. These bathtubs have long been a symbol of decadence and comfort, and THD makes it easier than ever to bring one of these glorious tubs into your home. The trend has been gaining popularity in the 19th century, a clawfoot bathtub adds a touch of luxury to your bathroom décor. Here you will be able to choose from many different styles, like double-ended, double-slipper, roll-rim and pedestal tubs. We carry a wide variety of finishes and colors to suit any color scheme or bathroom design style. Copper, stainless steel, antique white and biscuit are only some of the colors and finishes we offer. With your budget in mind, we can even offer some units with Free Shipping. 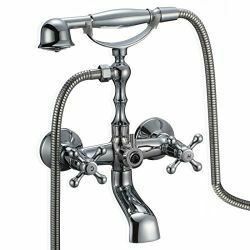 Further, you will be able to find many add-ons for your stand-alone clawfoot bathtub, including shower rods, faucets, and showerheads. We have convenient search-tools so you can filter products by price or style. And if you not sure about a product you can always check-out the customer reviews. That way, you can be sure to get affordable accessories that other shoppers have already recommended. 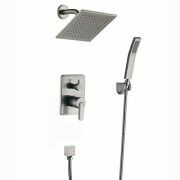 Our elaborate showerheads section also comes with a variety of finishes and colors, so you can match it to your bathtub, budget, and style. And the handheld shower units let you take full control. 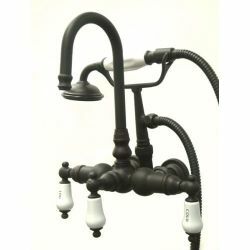 Our clawfoot tub fixtures include bath faucets in various finishes and styles as well. 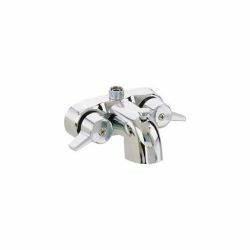 And these polished brass faucets and handles can add a lot of style to your bathroom. Finish off your bathroom accessories with a handy set of bathtub organizers to add the final touch to your personal oasis. With a clawfoot tub from Top Home Design, it will be very tempting and easy to take a little time out of the day to soak up some peace and quiet.